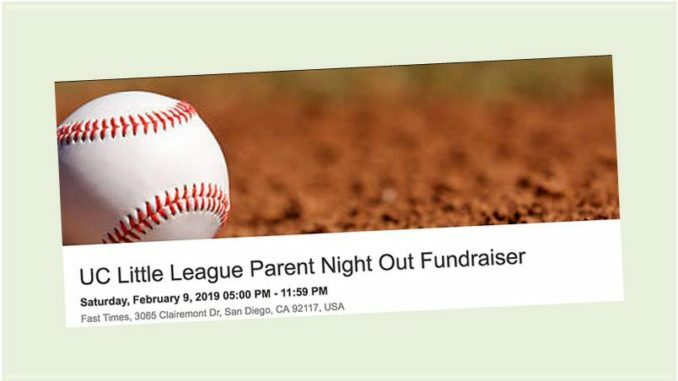 University City Little League is hosting a Parents Night Out Fundraiser on Saturday, February 9, 2019, at Fast Times, located at 3065 Clairemont Drive. The event helps support UCLL baseball in the UC community. UCLL is a 100% volunteer organization which needs funding for equipment, uniforms, field improvements and umpires. The event starts at 5 PM with dinner, music, raffle, silent and live auctions. At 7 PM, live band Classic Buzz starts performing. Cost is $25 per person, and includes dinner (tri-tip or veggie), and one raffle ticket. The fundraiser is for adults only, and is a good time to meet friends and fellow baseball lovers, and enjoy an evening supporting local baseball. And save the date for February 16 when we hold our equipment exchange and donation event. Don’t forget that Opening Day is Saturday, March 2. Join us as we begin another baseball season here in UC. Opening Ceremonies begin at 9:00 AM followed by our traditional T-Ball Otter Pop race, snack bar specials, games and other fun activities. We hope to see you on the field!